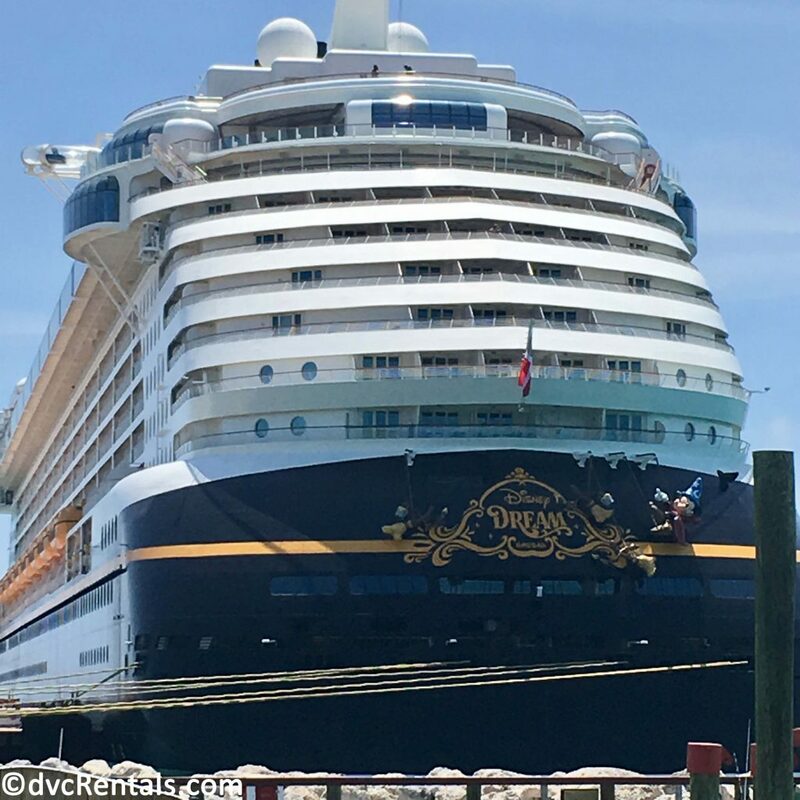 Bigger Is Better - Living the Large Life on The Disney Dream! 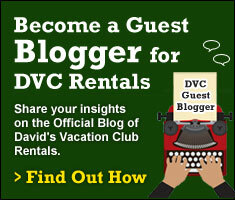 As one of the Cruise Specialists at David’s Vacation Club Rentals, I recently had my very first chance to sail the seas with the Disney Cruise Line! As a first-time cruiser there was one word that popped into my mind as soon as soon as we pulled into Port Canaveral and got our first glimpse of the ship – BIG! 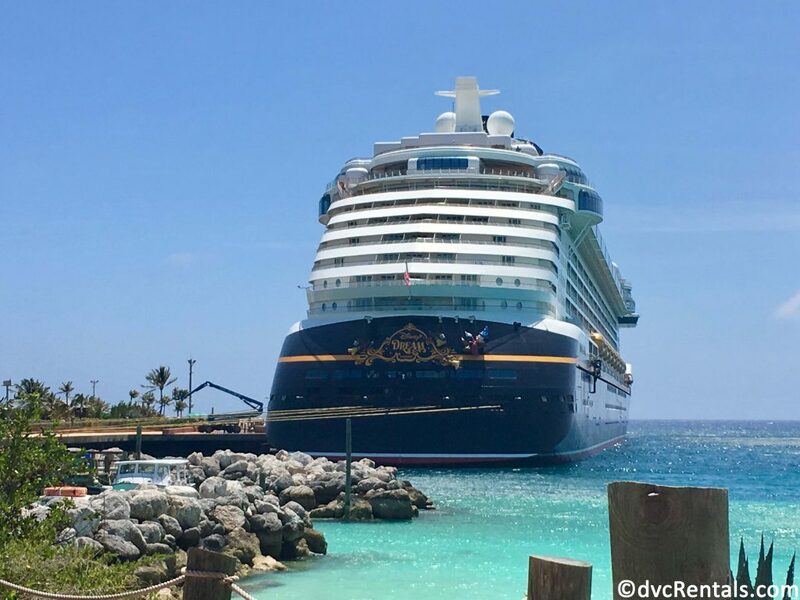 For our 3-Night Bahamian Cruise we sailed on the Disney Dream which is one of 4 ships in Disney’s soon-to-grow-again cruise fleet. As we approached Port Canaveral and could see the ship off in the distance, I was awestruck by its size! The Dream looks like a high-rise apartment building/entertainment complex floating on the water. With 14 decks, 1250 Staterooms, weighing in at 130, 000 tons, it towers over the water it floats on. 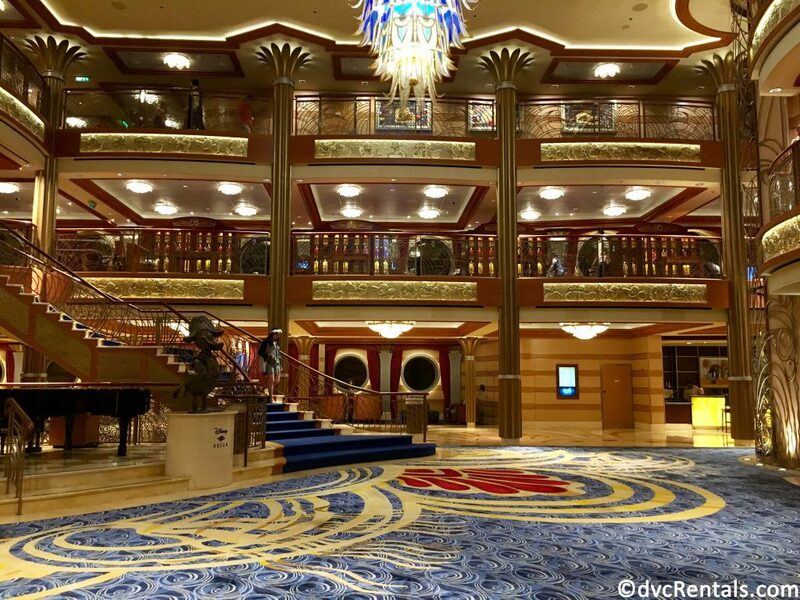 While the Disney Dream is a very large ship, it was very easy to navigate inside, and it wasn’t long before we got our bearings. All amenities, dining, and entertainment were only a quick stroll away and could be reached within a matter of minutes! 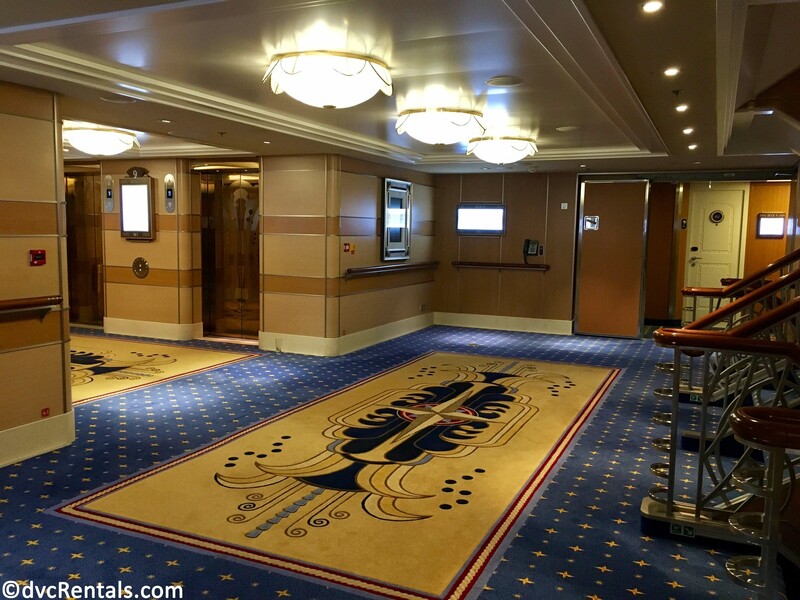 There are elevators located in the forward, mid-ship, and aft (rear) areas of the ship, with directional signs also posted near stairwells and hallways. The Cast Members onboard are also very happy to lend a hand if you find yourself a little lost at sea! 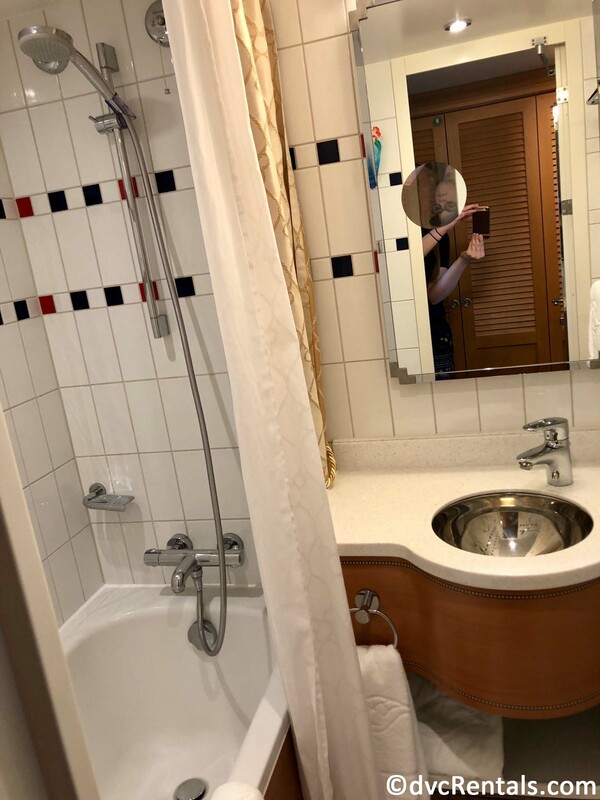 The Disney Cruise Line is known for having some of the largest staterooms at sea, and I was truly surprised at how much elbow room and storage space our cabin offered! There were two large closets with ample room to hang the clothes and supplies our suitcases held (and trust me, I definitely over-packed)! 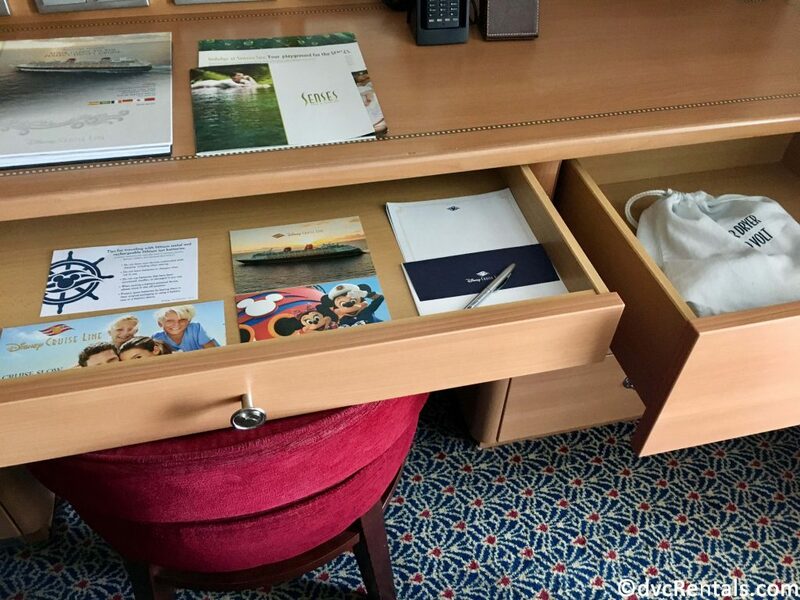 There were drawers and shelves all over the stateroom that were very handy for storing our snacks, trinkets, sunglasses, hats and more! Every little nook and cranny is used as efficiently as possible to ensure guests avoid feeling cramped. The beds are elevated high enough off the floor that larger suitcases and luggage can be stored underneath to keep the room from feeling cluttered. 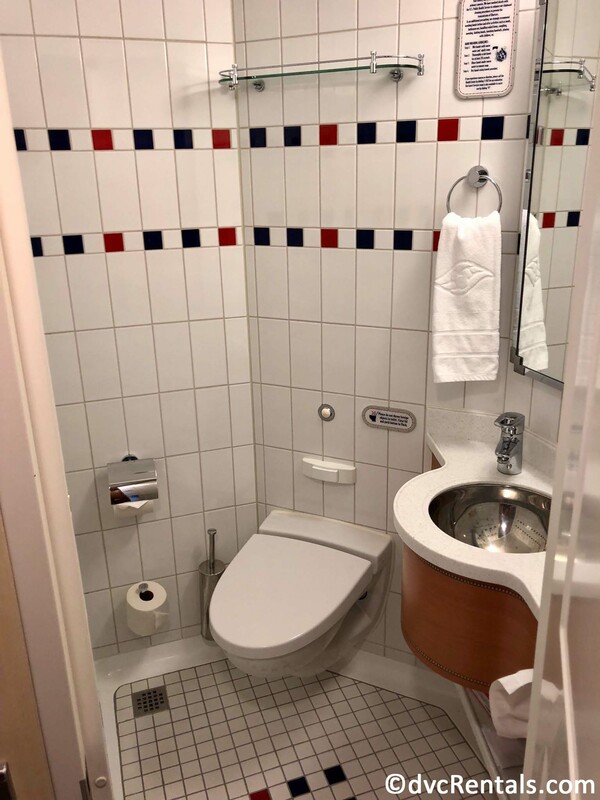 Many of the staterooms offer a split bathroom layout, with the tub/shower and sink behind one door, and the toilet and another sink behind another separate door. This layout was incredibly convenient for us during our voyage and helped save time (and probably a little patience) when preparing for the day’s activities. 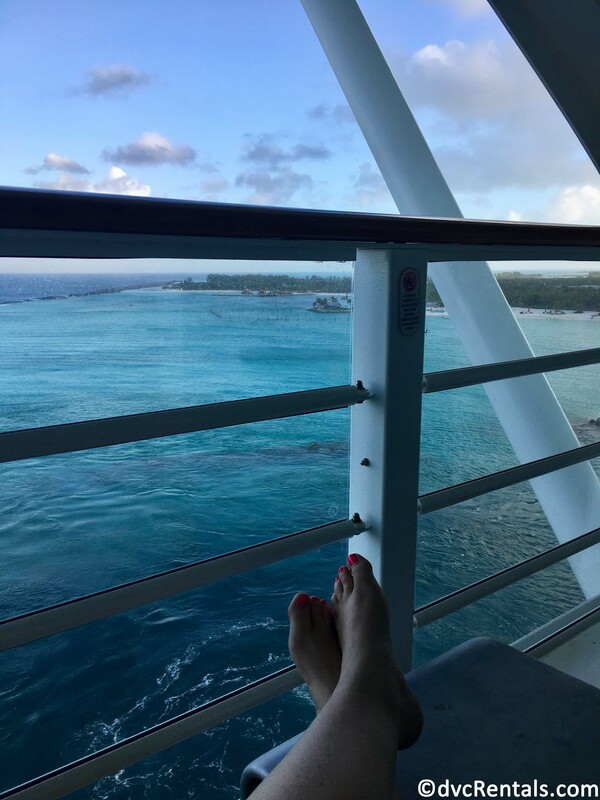 On our voyage, we were fortunate to have a fantastic room with a Navigator’s Verandah which allowed us some extra opportunities to take in the fresh ocean air and some breathtakingly beautiful views! The verandah also had ample space for two of us to sit out comfortably and relax even more. Big Décor and Disney Details! 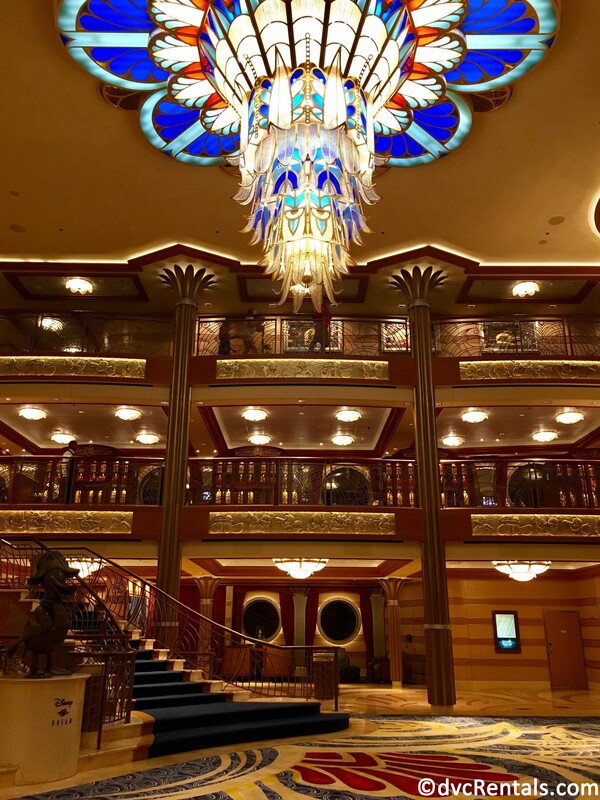 From the moment we stepped on board I couldn’t help but marvel at the gorgeous décor of the Disney Dream. 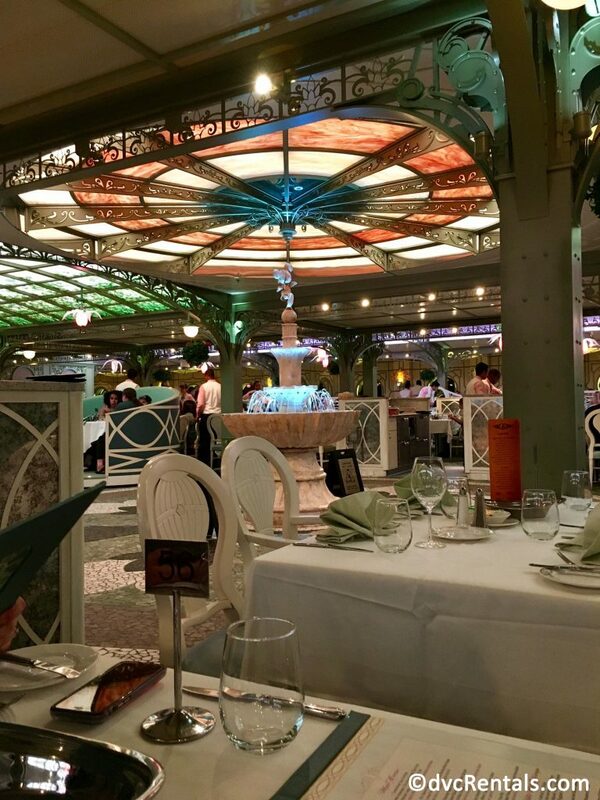 The Art Deco touches throughout the ship fill the surroundings with both big-time opulence and of course, big-time Disney fun! 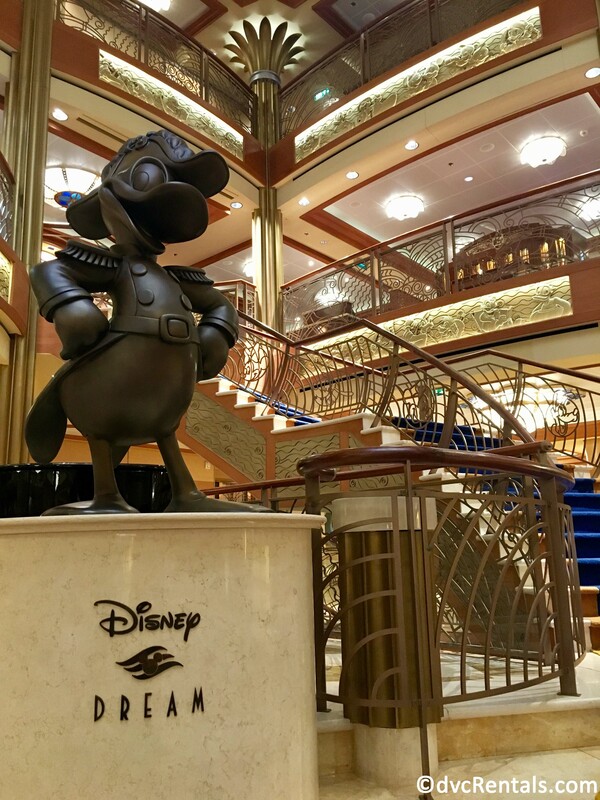 A statue of Donald Duck located near the grand staircase acts as the mascot for the ship, and the balcony railings through the lobby feature other beloved Disney characters. A variety of characters can be found all over the ship in fact, constantly surrounding cruisers with a sense of whimsy and warmth. My favorite element of the lobby though would have to be the incredibly stunning chandelier which gives the space a real elegance. It is truly a big work of art that shimmers with beauty and shines a warm glow down to the guests below. 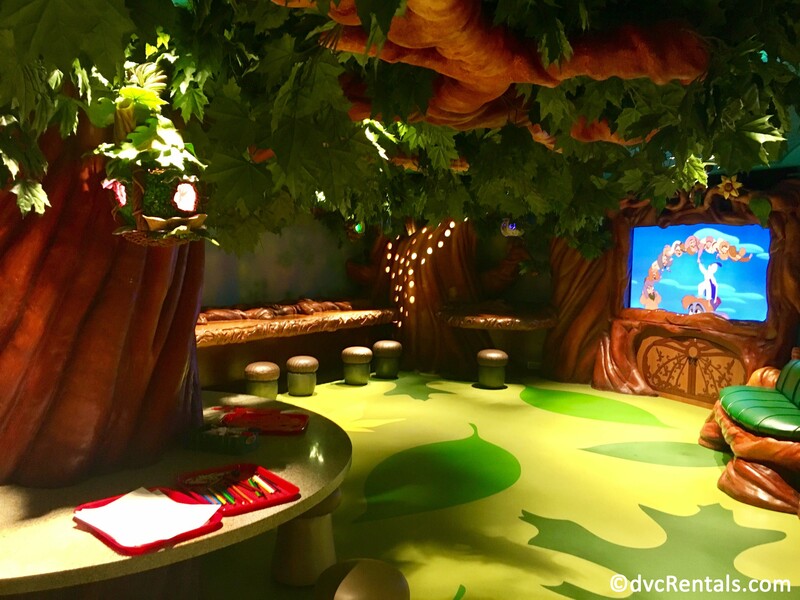 The children’s areas of the ship have some of the most amazing spaces that are full of big time fun and bring the Disney magic to life! 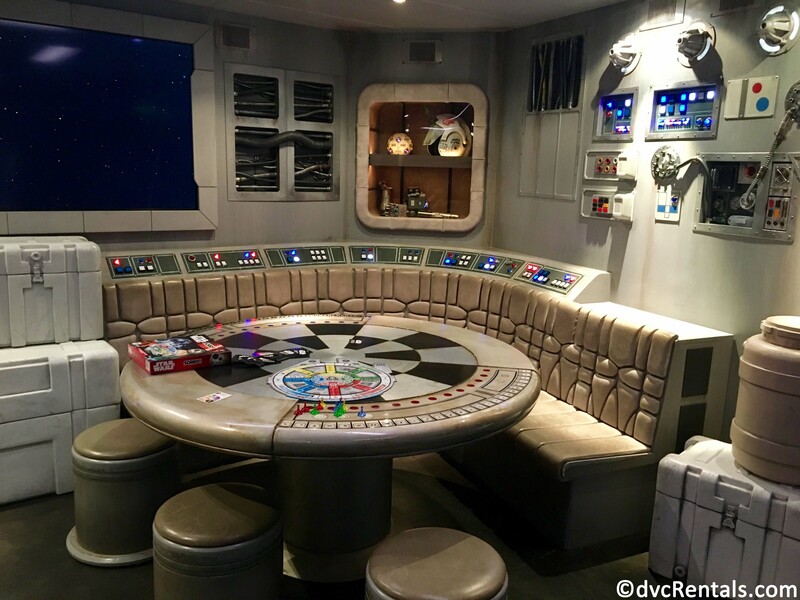 The Oceaneer’s Club allows kids to hang out in spaces inspired by Star Wars’ Millennium Falcon and Tinkerbell’s Pixie Hollow. Even though I’m a “grown-up,” I could have spent the entire day playing here! 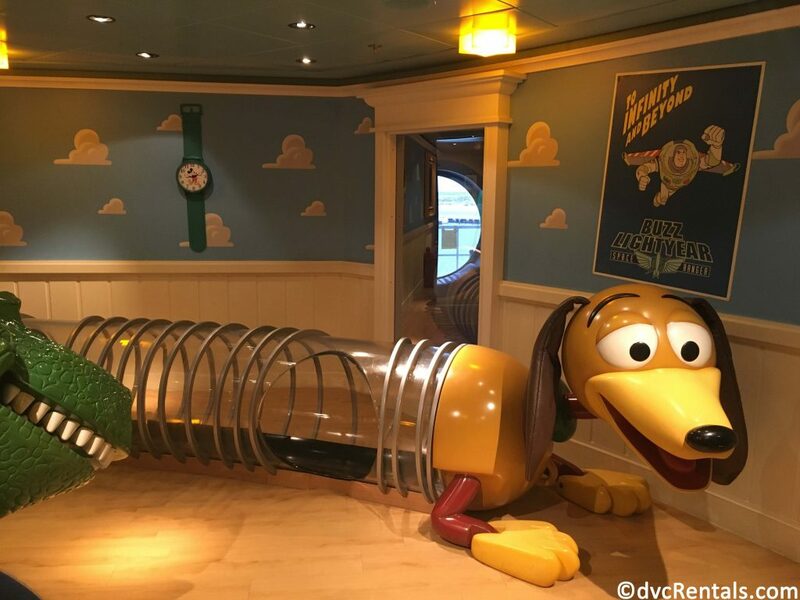 My favorite area is Andy’s Room, where you feel just like one of Andy’s toys and Slinky Dog, RC, and Rex are hanging out ready for playtime! You’ll be smiling ear-to-ear and humming You’ve Got A Friend In Me before you know it! 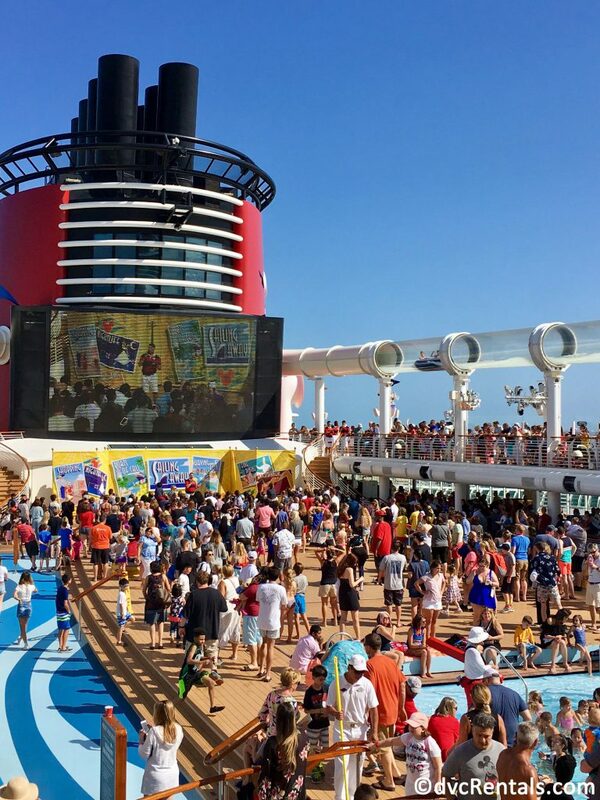 The spaces for little ones, tweens and teens are just the beginning of the amazing entertainment that the Disney Cruise Line has to offer! 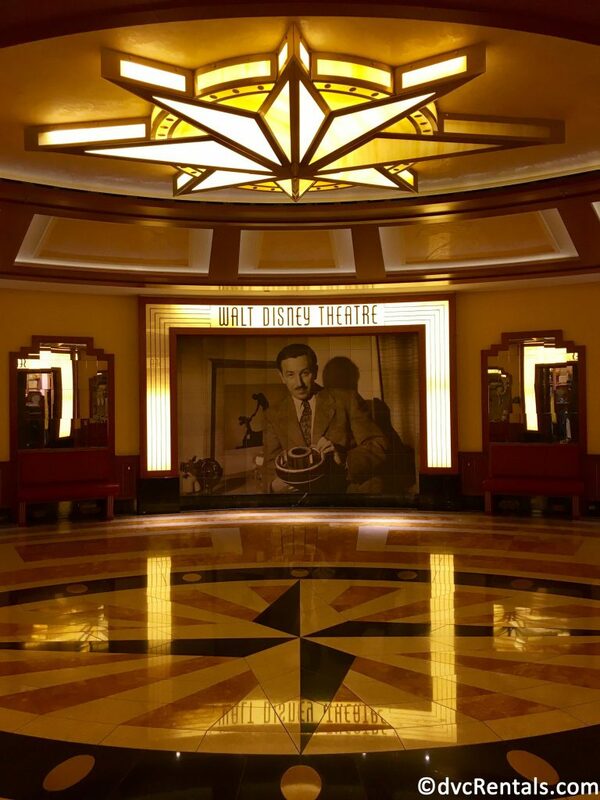 During our voyage on the Disney Dream, we enjoyed 3 different Broadway-caliber shows in the Walt Disney Theater. There is no need to purchase additional pricey tickets; the shows are included in the cost of your cruise! Each show was full of high energy songs, mind-blowing special effects, and the Disney magic we all know and love! The Disney Cruise Line also knows how to party! Our cruise included two awesome deck parties. First, we attended the Sail Away party, which celebrated our departure from Port Canaveral with song and dance and some favorite characters! The second deck party on our cruise was Pirate Night! 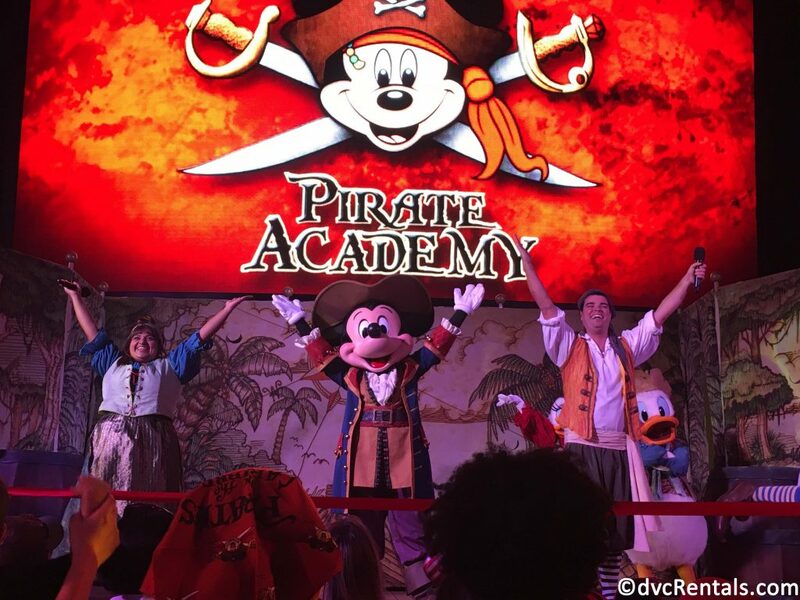 Mickey, Minnie and the gang taught us some fun pirate moves and took on Captain Hook and Mr. Smee in a delightful stage show! Guests are welcome to dress up in their swashbuckling best and are also treated to an awesome display of fireworks at sea, as well as a post-party pirate buffet at Cabanas with some fantastic special touches! 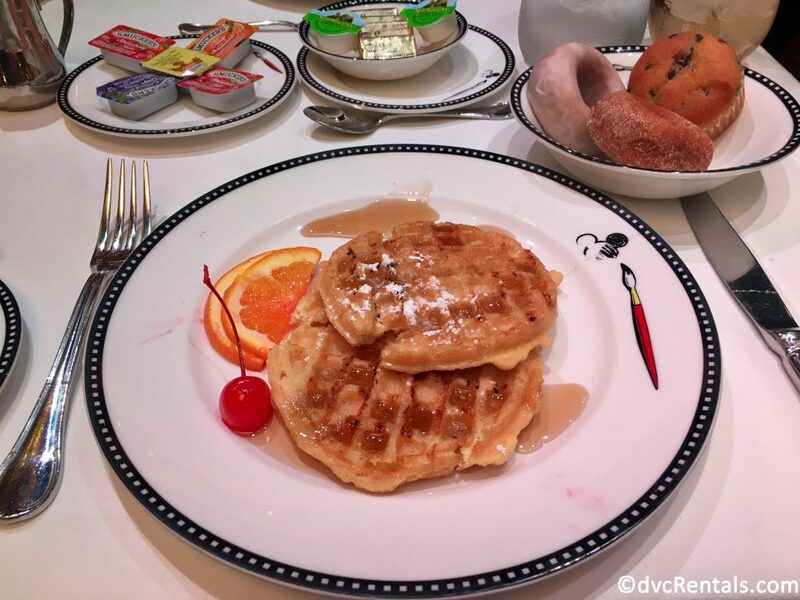 The Pirate Party buffet is just one example of the chances that guests aboard the Disney Dream have to fill their plates with delicious food options. There are several quick service counters for hungry cruisers to take their pick from, as well as self-serve ice cream stations, and the Cabanas buffet which serves up an extensive variety of dishes! There are also three dining rooms that guests rotate through for dinners (and possibly breakfast as well). Be sure to bring your big appetite with you on your trip! While all three locations were wonderful, Animator’s Palate was definitely my favorite. 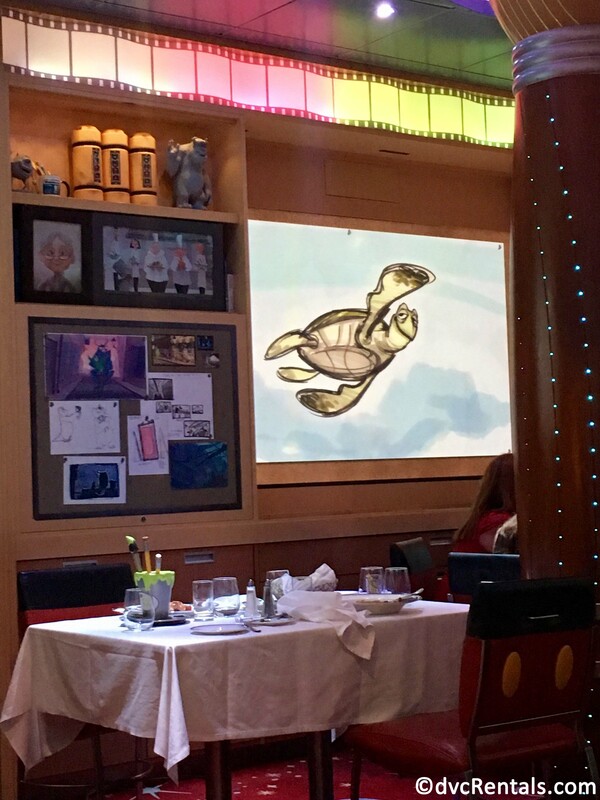 We even got the chance to chat with Crush the sea turtle from Finding Nemo! It’s no secret that Disney is known for their top-notch service, and the Disney Cruise Line is a prime example of this. A very big effort is made to ensure that each person onboard is made to feel like a treasured guest, and we left the ship feeling like a big extended family, even after only three nights! The serving staff in the dining rooms are quick to pull out your chair and place your napkin on your lap – Be Our Guest indeed! 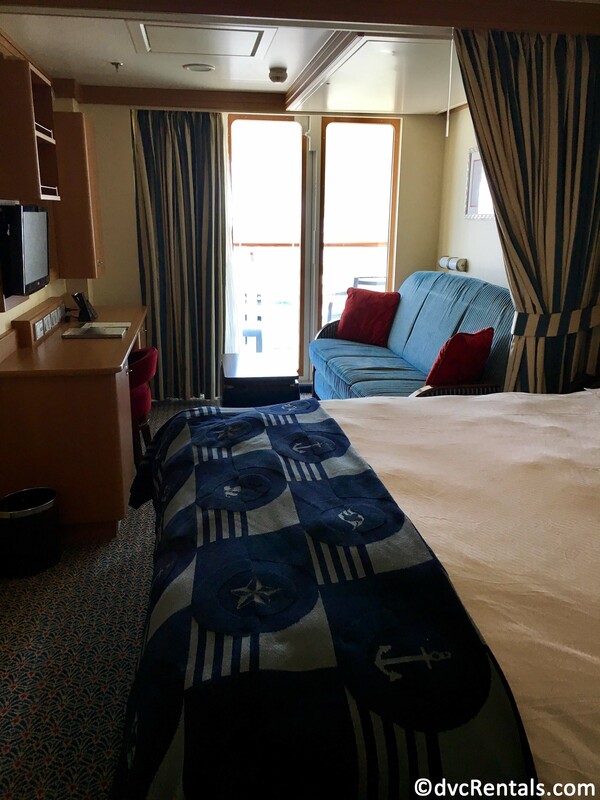 Our stateroom steward made every effort to ensure we were comfortable in our cabin and that we were enjoying our time onboard. 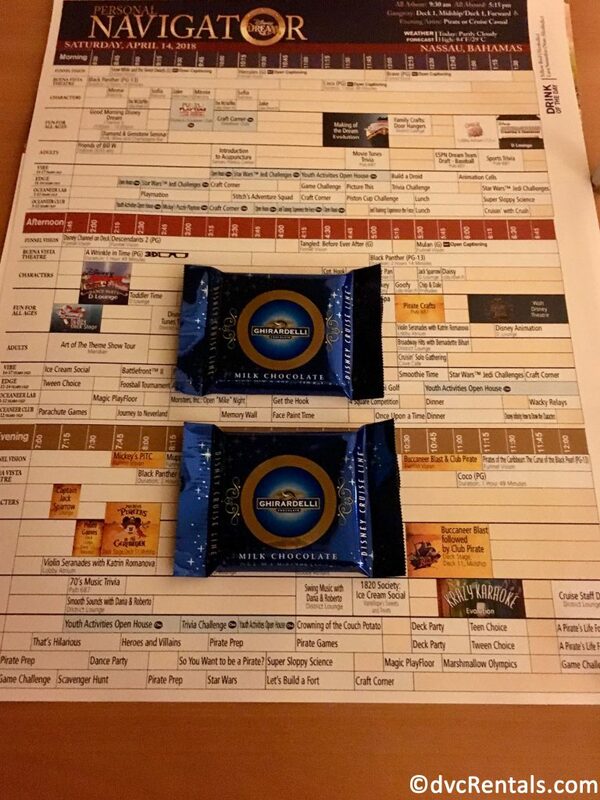 Another luxurious perk of sailing with the Disney is the turndown service offered in your stateroom. We would leave our cabin in the morning, and return after lunch to see the sleeper version of the sofa magically disappeared, bed made and supplies replenished. We would then leave again for our evening activities and would return to our stateroom to find comfy beds set up and ready for us to get our beauty sleep. Not only that, but the next day’s Navigator, along with Ghirardelli chocolates, and a new towel-animal friend would be waiting for us as well! Disney definitely knows how to add as much magic as possible to your sailing! 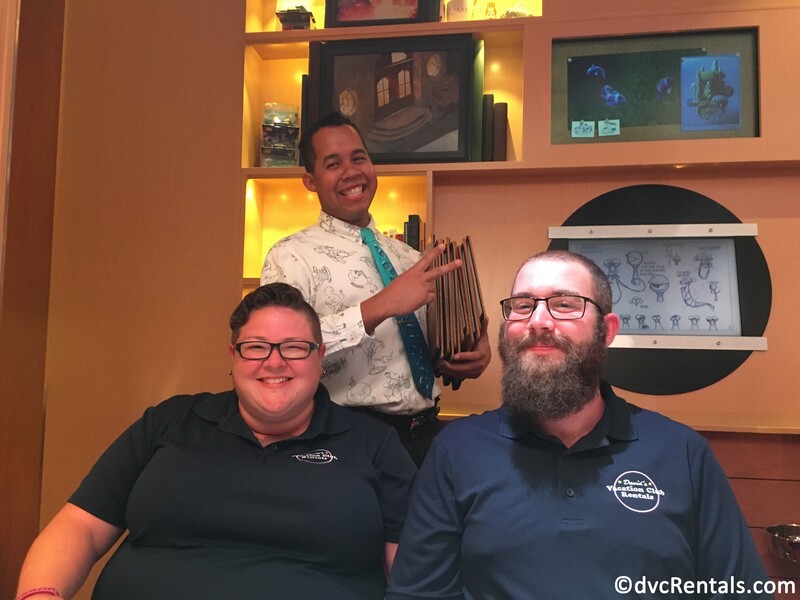 Disney aims for their guests to feel as relaxed as possible on their vacations and do everything they can to make traveling with them as easy as can be! Ground transportation can be arranged and is a fun and comfortable way to get to and from the port. 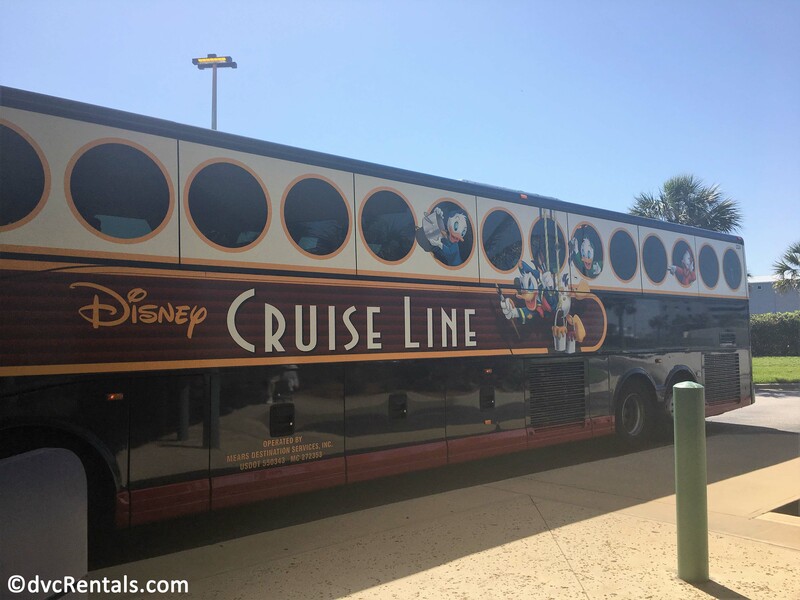 The ride from the Orlando International Airport to Port Canaveral is only about an hour and that time flies right by. Once you have checked-in at the terminal (which was as smooth as could be) you will be given a Key To The World card which acts as your stateroom key, method of payment for any purchases made on the ship, and is also needed to get on and off the ship at the ports of call. Most guests will keep the card on a lanyard worn around their necks for easy access. Another great feature on Disney’s ships is the Navigator app which can be downloaded onto your smartphone! The app keeps an electronic copy of the day’s activities, dining room menus, showtimes, ports and more right at your fingertips and is very easy to use. 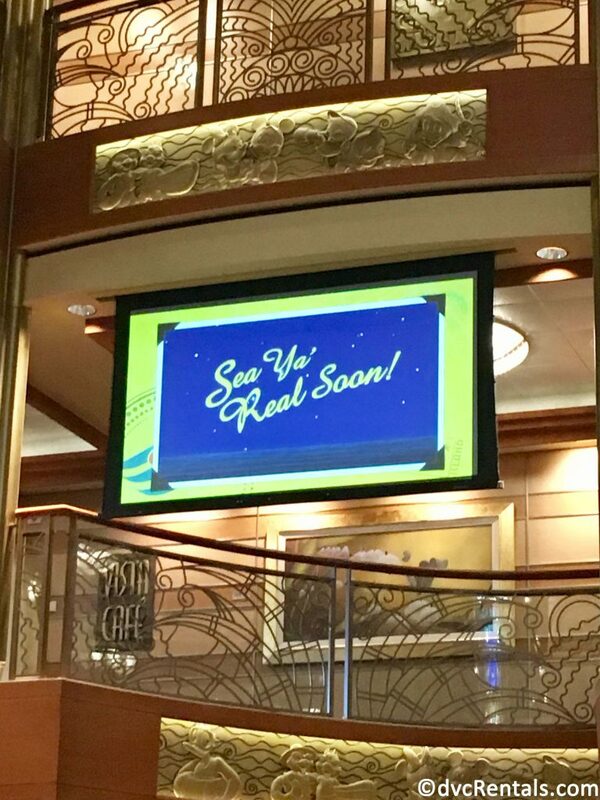 It also offers a text messaging system that guests can use to keep in contact with the friends and family they are traveling with while onboard the ship (along with the wave phones in your stateroom). From group activities, kids’ clubs, pools, waterslides, movies, and theater shows, to nightclub lounges, deck parties and more, there is no shortage of fun and excitement to be had during your cruise! Our group really enjoyed the trivia and game shows; however, one of my personal favorites was the “silent” dance party held in the Evolution lounge. Here we were each given a pair of headphones with three different music channels on it, and you could then choose your favorite. Everyone on the dance floor was dancing to a variety of different music styles, but we were all having an absolute blast! 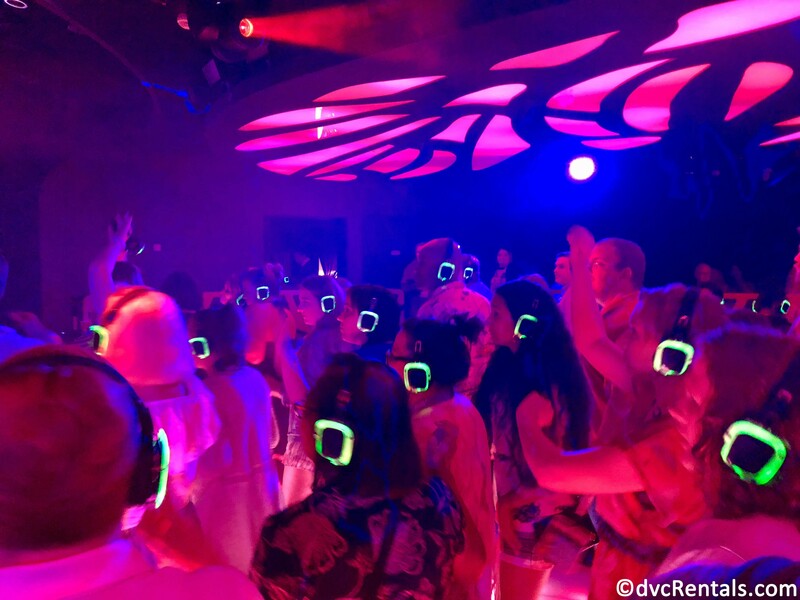 The greatest part was taking your headphones off for a second to hear everyone singing their different songs out loud – so funny and such an original experience! The ports of call also offered a lot of opportunities for big fun, as there are many excursions offered for guests to experience. Guests could explore the Atlantis resort, go fishing, enjoy a guided tour, or take advantage of a local beach. We took the opportunity to wander the shops in Nassau and enjoy the blue skies and sunshine! 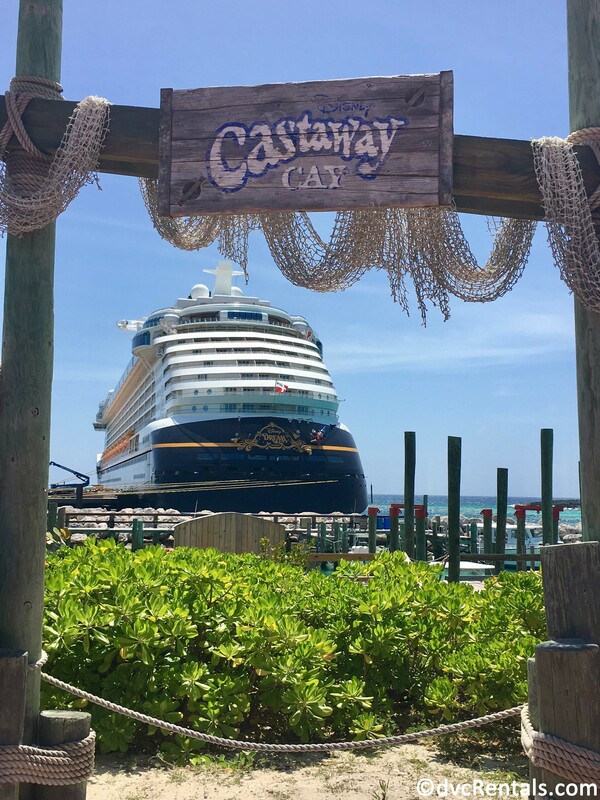 My very favorite part of our cruise was our stop at Castaway Cay, Disney’s private island in the Bahamas. 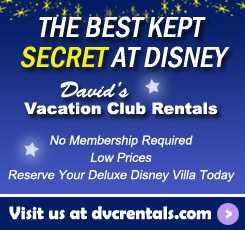 The island offers gorgeous beaches, water activities, a kid’s club and more! 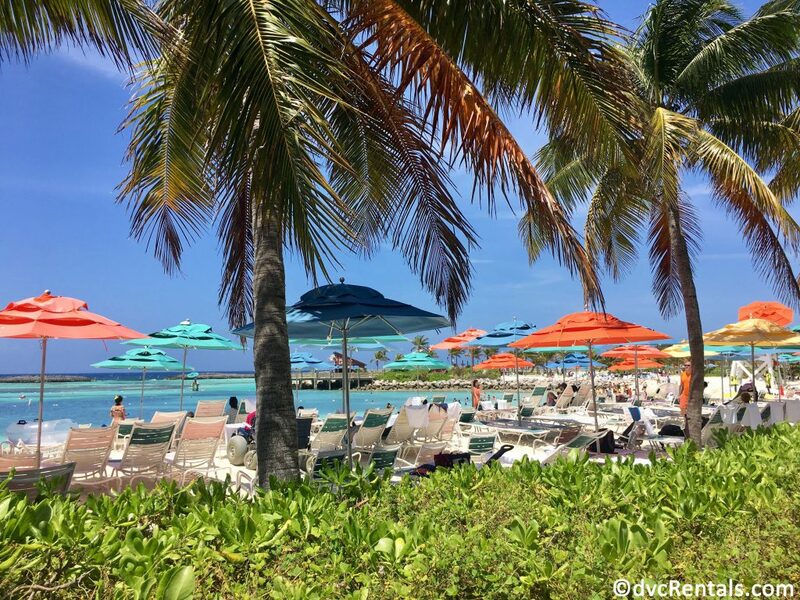 We had perfect weather on our day at Castaway Cay and loved lounging on the beach! We enjoyed a great BBQ lunch at Cookies (included in the cost of your cruise), splashed down the waterslides in the ocean, and got some frozen treats at Olaf’s Summertime Freeze. 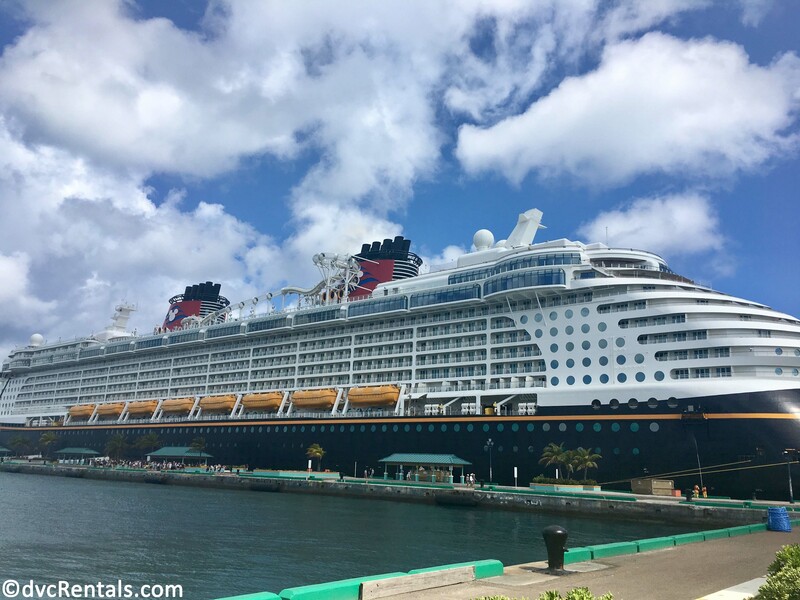 Now that I have gotten my sea legs, I can’t wait to sail away on more adventures and experience even more of Disney Cruise Line’s big offerings of luxury, fun, and most of all magic!